Arborwear Double Thick Zip Up Sweatshirt (000400241) Northern Sport Co. The warmth of a sleeping bag. The mobility of not wearing a sleeping bag. Two layers of thick, 12 oz. 100% pre-shrunk cotton fleece for warmth, and gusseted armpits for freedom of movement. 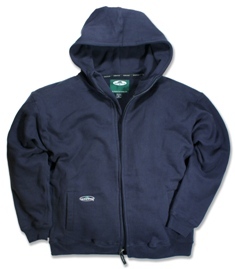 Full Zip front extends past chin for added coverage in colder weather.